Last week, NPR released the fourth year of internal studies examining the diversity of its sources: people who are interviewed or quoted in stories, either on-air or online. The results of those studies, conducted in fiscal years 2013 to 2016, pointed to a serious challenge for NPR: Its sources were overwhelmingly white, male and coastal. In FY2015, the latest year of the study of on-air programs, sources heard on the newsmagazines Morning Edition and All Things Considered were 70 percent male and 73 percent white, and about 40 percent came from Washington, D.C., California or New York combined. This is a problem for NPR, just as it's a media-wide problem that has drawn the attention of scholars and media analysts and prompted the creation of source banks (like NPR's Source of the Week) and discussion around newsrooms' unconscious biases. Listeners, too, have written the Ombudsman's Office with concerns, specifically about women's voices being underrepresented. Barbara Hart, of Portland, Ore., wrote to us about a story that focused on a women's health care issue: "Include women at all levels of your reporting. Do your work to identify and include female experts and leaders! And for goodness sake, rely on women to discuss women's healthcare!" Her concern was hearing only a male reporter and a male newscaster in one version of the story; a longer Web version quoted a female patient. Still, Hart's point is well-taken: The findings from NPR's 2015 study of on-air sources showed that men made up 70 percent of people who were interviewed as subject matter experts. Shankar Vedantam, host of the NPR show and podcast Hidden Brain, notes that when women's voices are heard, they still may not be heard as experts or as people of authority. Nonetheless, the earlier studies were eye-opening to many in the newsroom; some told me they were embarrassed by the results. Keith Woods, NPR's vice president of newsroom training and diversity, who oversaw the studies, said they led to valuable conversations and prompted some short-term projects. One newsroom leader, Kenya Young, acting executive producer of Morning Edition, says the studies helped make source diversity front of mind for the newsroom. "I do think it created a mind shift in the way people think in how they're sourcing and thinking," she said. "There certainly still needs to be conversations about it, certainly there needs to be times that we're called out about it, but we don't need to have these formalized sessions in order to keep getting people thinking about it, because we've thought about it hard for three years." Still, those studies were conducted with data from almost two years ago, and there has been no new formal tracking of sources since then. Woods just announced a commitment for a new round of data collection. But, in the absence of current numbers, and an official companywide program to address source diversity, some in the newsroom have taken it on themselves to track the diversity of their own sources. Weekend Edition Sunday host Lulu Garcia-Navarro and her staff have been tracking the gender and racial/ethnic breakdown of her interview guests since March. Tracking is not complicated, she said. She and her staff spend a few minutes over lunch after every show counting the interviewees for that week and, to the best of their ability, determining what percentage were women or people of color. The numbers fluctuate, Garcia-Navarro said; some weeks they do well on their gender ratio and not so well on having people of color on air. Some weeks, it's the opposite. As she and others noted, the purpose of diversity tracking should not be that every single story or even every single show have perfect representation; the news simply does not work this way. More important is the bigger picture. "I think that there's a real appetite for people to be addressing the problems that they see. And so this is one small way in giving them some agency in doing that," Garcia-Navarro said. "You ultimately, in the choices of the stories that you're pitching — or if you get assigned because there's news of the week, who you're booking — you have choices." After learning of the results of the 2013-15 on-air source diversity study, science correspondent Nell Greenfieldboyce told me she self-analyzed her own pieces for gender and was dismayed that they were on par with the organizationwide numbers. She vowed to do better. But, "What I found is that it quickly, the pull of the routine pulls you back. And so even though I had that as something I wanted to do, I failed to do it," she said. Earlier this year, Greenfieldboyce revisited the issue. In her stories from March 2017 to March 2018, she found she quoted only 24 percent women. So she began tallying the gender of her sources on a sheet of paper she keeps in her sightline at her desk, and putting a concerted effort into quoting more women. After three months — from March to June 2018 — her stories featured 42 percent women. "Just paying some attention to the issue results in immediate improvement. But I know from experience that the trick will be maintaining that improvement over time," Greenfieldboyce said. Vedantam's Hidden Brain every year has prioritized investing resources and personnel time into surveying the last year's source data. Staffers count the breakdown of gender and racial/ethnic diversity, and they also count what percentage of the time men and women are heard on the podcast (not just the number of each) as well as what percentage of the time men and women are portrayed in expert roles, and what percentage of the time people of color are portrayed as experts. Hidden Brain was a product of Vedantam's book "The Hidden Brain: How Our Unconscious Minds Elect Presidents, Control Markets, Wage Wars, and Save Our Lives." "For a project that we started at NPR, it seemed to me it would be hypocritical not to try to actualize what the message of the book was, which is, one of the central ideas of the unconscious bias literature is that you cannot overcome biases merely by being aware of them ... It actually requires a fair amount of consistent effort," he said. He noted that after the 2013 source diversity data were made available to the newsroom staff, by 2015 the percentage of female on-air sources moved only insignificantly, to 30 percent from 28 percent. Vedantam said without an active struggle against bias, reporters will fall back into the tendency to quote the same sources over and over. "The tide is moving in a certain direction, and if you're not conscious of the tide, and you're not willing to go against it, you will be carried by the tide. And it's not your fault, even if you don't want to be moved in a certain direction, the tide will carry you," he said. Only by tracking and monitoring behaviors can one prevent an unconscious bias from shaping those behaviors, Vedantam said. Other institutional challenges work against source diversity at NPR; one is the diversity of NPR's newsroom staff. As of the end of 2017, the newsroom was 75.1 percent white. Part of the data collected on NPR's source diversity in 2015 showed that across the board, reporters tended to quote sources who share their racial identity. Black reporters quoted black sources 40 percent of the time, while white reporters quoted black sources 10 percent of the time. Latino reporters quoted Latino sources 52 percent of the time, while white reporters quoted Latinos 5 percent of the time and Asian and black reporters quoted Latinos 3 percent of the time. The same 2015 data showed women reporters (who accounted then and now for more than half the newsroom staff) still quoted 66 percent men. Men quoted men 75 percent of the time. Hiring a more diverse staff has been a priority of the newsroom for many years, but with only incremental progress to report. Another unavoidable factor is at play: Many of the news topics that NPR covers historically have been, and continue to be, dominated by white men. That's particularly true for politics and government, but also for business and academia (where many "expert" sources reside). Few women or people of color have reached the top of major organizations, and people at the top are most likely to be in the news. Additionally, a push in recent months to prioritize interviews and conversations (called a "two-way" in radio) between show hosts and politicians, experts or other journalists, as a way to stay on top of the rapidly changing political scene, is setting the newsroom back in terms of contacting diverse people, Woods said. A two-way results in the listener hearing only the voices of the host and the interviewee, whereas a reported piece could include the voices of the reporter and multiple sources. Those two-ways mean that listeners are more likely to hear from people who fall into the same categories NPR historically relies on: politicians, businesspeople or nonprofit leaders, professors and other journalists, "all of which threaten in my view to push us back toward a narrower universe of sources," Woods said. Sarah Gilbert, the acting vice president for news programming, acknowledged that challenge. "We are now saying, 'Who's playing a role in this unfolding story and how can we get as close to the story as possible and the inner circle of the people who are affected?' So that has I'm sure made some difference," she said. But she added that newsroom staff members are looking for more diverse sources and angles as a story progresses over multiple days. Additionally, the demands of the news cycle often require the production team to lock down the first live body that meets the most basic qualification to be an NPR on-air source: They must be a "good talker." Those are sources who know how to break down the issues in a digestible way for the audience, in clear sound bites. With a little more work, however, journalists could get more diverse sources on air. There are many qualified women and people of color who are experts on newsworthy topics but have never spoken to a media outlet. They aren't necessarily worse at speaking on the air, they may just have had fewer opportunities to do so and might need to work a little longer with a reporter. That's easier, however, for weekly shows and podcasts with longer production time. NPR reporters might also have to consider changing the way they approach their beats. Greenfieldboyce had always contacted the lead (or first-named) author of a scientific study for an interview; they tend to be white men. She found that if she reaches out to some of the contributing authors to the same study, she is more likely to be able to interview women and people of color. She has also started asking her sources to suggest more female experts. The Education Desk, led by Steve Drummond, found that a shift in mindset can increase diversity where not much may exist. "We created NPR Ed four years ago and the intention was to say, 'We're not going to write about Republicans and Democrats, but we're going to write about teachers and students,'" said Drummond. Asking whose perspectives are not being represented is part of the standard practice of journalism, Drummond said. On the Education Desk, the value of speaking to a diverse range of people is well-established, so it's not unusual for entire stories to quote only women or people of color, even though the team hasn't adopted a formal practice of tracking the diversity in their sources. While it's true that the pool of education policymakers is less diverse than the overall population, by shifting the way the reporters think about covering education stories to focus on people who are affected by those policies, the sources were more diverse. Randomly check in with coverage. Each office within NPR could assign someone the responsibility to spontaneously collect and review source diversity data over a short period of time, say two weeks, or for a particular topic that got extensive coverage. Utilize flexible segments of shows or develop a series that will bring in more diverse voices. If coverage topics seem to be skewing toward homogeneous expert sources due simply to the news cycle, find a different way to incorporate new voices. Ammad Omar and Natalie Friedman Winston, acting supervising editors of the weekend All Things Considered, hosted by Michel Martin, give the example of their "Barbershop" segment, a roundtable on a current issue, as an opportunity to bring in voices that may be missing elsewhere. Finally, I think it is imperative that more NPR journalists join their colleagues in actively monitoring their own source diversity, and that more show hosts, producers and editors encourage this among their staffs. As Woods said: "You can't succeed without the Shankar or the Lulu or the Michel. You can't. You can have all of the top-down messaging that you'd like, and it will fall apart at the executive producer and host and desk editor level. What you could have is more desk editors who are saying to reporters, 'Not good enough. 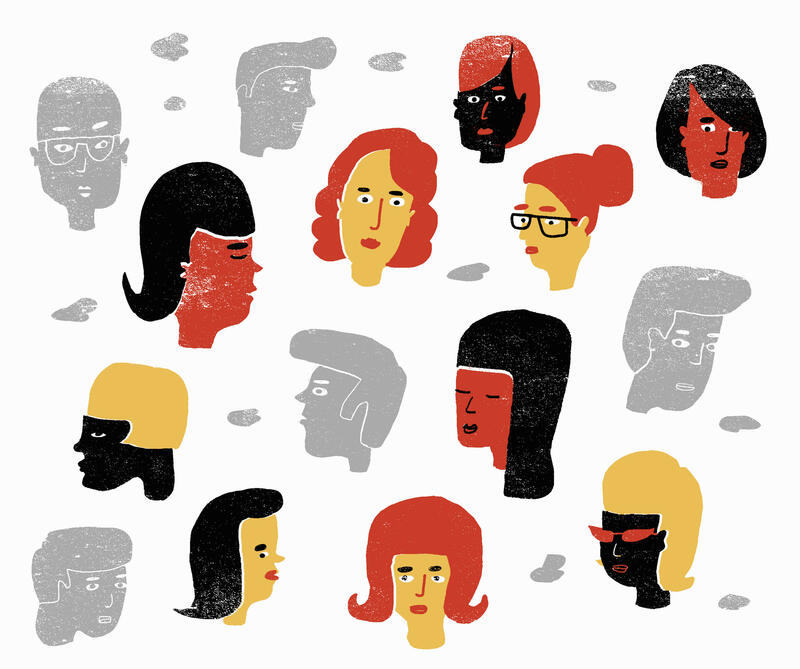 Get out there and try harder at diversity in your sourcing.'" Most often, I heard a plea for NPR to conduct an updated study. One thing is clear: The state of the diversity of NPR's sources today is unknown. Without any updated data, it's impossible to know whether NPR is moving in the right direction. The original study made the issue top of mind in the newsroom and it's likely that any new one would, as well. Woods' recently announced commitment to gather new data will help the newsroom assess how best to prioritize source diversity.